Markings: The left side of the slide is marked “PATENTED APR.20.1897 / SEPT.9,1902 DEC.19,1905. FEB.14,1911” and “COLT’S PT. F.A. MFG. CO. / HARTFORD, CT. U.S.A.”, with a Rampant Colt logo at the rear of the slide. The right side of the slide is marked “MODEL OF 1911. U. S. ARMY”. The right side of the frame is marked “No. 6464”. The left side of the frame is marked “UNITED STATES PROPERTY” and behind the trigger with a circled “WGP” (Major Walter G. Penfield, Colt1911 Pistols 1909-1914). The underside of the barrel in front of the lug is marked with “5” and the top rear edge of the barrel above the chamber is marked with a sideways “H” with serifs, which is the correct marking for a gun with SN < 6500. The top rear face of the slide is marked with a vertical “H” without serifs (The slide was probably made later than the barrel, after the change to a vertical mark had been made, making this a transitional marked pistol. The flat on the top rear of the frame is marked “H” (with serifs) and “R”. The flat on the underside of the slide is marked “T” at the front and “2” at the rear. Sights / Optics: The front sight is a short-rounded blade. The rear sight is a “U” notch dovetailed into the slide. Stock Configuration & Condition: The grips are checkered walnut with smooth diamonds around the grip screws. The grips are dark with oil staining. There are a few dings and bruises in the smooth diamonds of the right grip. The checkering shows light to moderate wear with heavy wear along the bottom edges of the grips. There are several tiny mars in the checkering. The grips rate in about Very Good condition. Type of Finish: This pistol has a high luster blued finish. This is the correct finish for a pre-war pistol. Bore Condition: The bore is gray with light wear in the rifling. There is extremely light erosion scattered throughout the bore. Overall Condition: This pistol retains about 72% of its metal finish. There is pinprick surface erosion scattered over the left side and top of the slide. There is finish loss on the edges of the slide and frame, and the bottom edge of the grip safety, with thinning in the underside and top of the slide, grip safety and front strap. There are several small dings and a few light scratches in the front strap, deep scratches in the left side of the frame under the slide release, and several small scratches on the right side of the frame. There are light handling marks scattered over the remainder of the surfaces. The slide serrations are sharp, the knurling on the hammer shows light wear and the knurling on the remaining small parts is sharp. The screw heads are sharp with minor screwdriver marks. The markings are crisp. Overall, this pistol rates in about Very Good condition. Mechanics: The trigger pull is crisp and the slide is tight on the frame. The action functions correctly. We have not fired this pistol. As with all used firearms, a thorough cleaning may be necessary to meet your maintenance standards. Box, Paperwork & Accessories: This pistol comes with one blued two-tone magazine with a lanyard ring on the bottom, which is the correct type for a WWI pistol. Furthermore, the top rear edge of the spine is cut square, with a slot and keyhole just below it. The keyhole magazine is correct for a pistol with SN>4500, up to about 30,000. The magazine shows light wear and is in about Fine condition. There is another lanyard ring on the bottom of the mainspring housing. Our Assessment: The 1911 and 1911-A1 pistols served the military of the United States from 1911 to 1985, through two World Wars and the Korean and Vietnam wars. They gained a reputation as a reliable handgun with plenty of stopping power and are held in high regard by those who have used them. This is a Colt Model 1911 that was made for the U. S. Army in 1912, the first year of production. The pistol has the correct inspection and proof marks. The barrel and slide ordnance inspection marks show the pistol was made in the transition period just before SN6500 where the ordnance inspection marks changed from a horizontal “H” to a vertical “H”. The magazine has a keyhole in its upper spine, which is correct for those pistols made from about SN4500 to SN30000. The pistol is in about Very Good condition with 72% of its original bright blue metal finish remaining. 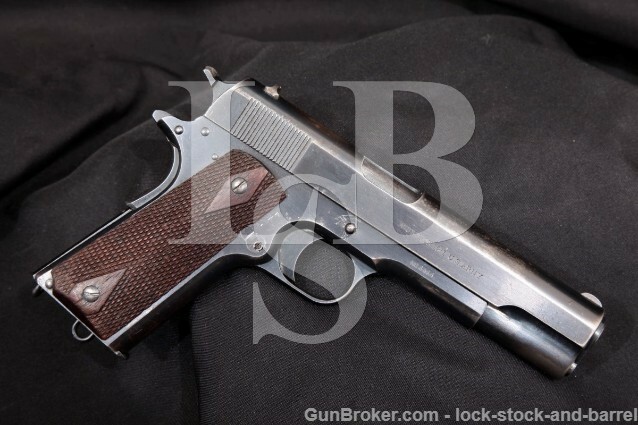 This is a very early Colt 1911, and the early Type 2 keyhole magazine is rare and collectable. This pistol is destined for a high-end Colt collection. CA Legal or CA Private Party Transferable: This C&R eligible handgun CAN be transferred as a dealer sale in California and CAN be sold as a Private Party Transfer (PPT) at our Simi Valley shop. All cartridge firing handguns (even C&R’s and antiques) sold to a California resident must be DROS’d. This does not apply to out of state residents.